Baler in Aurora, Province has been on my wishlist of places to go to in the Philippines for sometime. I would silently envy my friends whenever I see them on FB with their tanned bodies, holding their surf boards and enjoying the beach. But fate has a way of making your dreams come true. 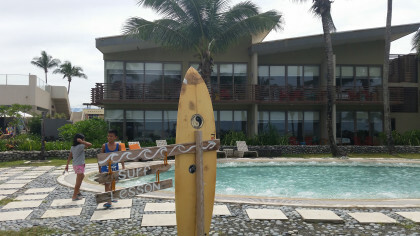 In my case, I wasn’t only able to explore Baler last weekend, we also stayed in the best resort in town: Costa Pacifica. I can’t tell you enough how beautiful and picturesque Costa Pacifica is. Its homey, island design blended seamlessly with the natural environment to resemble paradise. Costa Pacifica was right smack in Sabang Beach. It exuded the cool vibe and was in the heart of all the surfing action. I loved how the staff dressed casually in shorts & denim for work. How fun is that? We were welcomed no less by Resident Manager Gerard Canillo (middle) and his team. The charming attendant served us their irresistible welcome drink: buko lychee juice. It was good enough that you would fall in love with the exterior of this world-class resort. But the rooms were another matter. They were designed to make you fall in love more. I totally dig the colors and the beach theme. So pleasing to the eyes! The larger suites had a kitchen and his & hers bathroom, with tub. At night, my roommate Christine and I relaxed in the veranda where we had a good view of the shops and bars by the road. Wifi was a bit problematic in our room on the third floor. Though I would advise you if you have the weekend off in paradise to tune out of the internet too. LOL. Eat. Swim. Surf. Sleep. Repeat. All these you can do in Costa Pacifica. If the first thing on the agenda is Eat, that’s no problem. The main restaurant was called The Beach House. It had this long bar in the middle and was bedecked in eye-catching globe balls designed by a Filipino artist. The menu conceptualized by head chef Romy Aumentado consists of international specialties, with lots of local flavor thrown in. We ate lots of food. Our meals at the Beach House are worthy of another blog post. My favorites were the dishes using pako or local fern, chicken binakol (tinola with coconut juice as soup base), and the creamy kare-kare using Nanay Pacing peanut butter. Of course, don’t forget the native suman for dessert. The swimming part was most impressive. Costa Pacifica had this wonderful L-shaped swimming pool with a separate spot for kids. After our three days, two nights stay, Baler is now my favorite vacation place. Being reachable by car only five to six hours from Manila matters too. I can’t wait to bring my kids to the town and stay at Costa Pacifica. I just know they will enjoy it, every step of the way. – The rates are inclusive of the following: set breakfast for two adults and two kids, 7 years old and below; bottled water and round-trip transfer to the Baler bus terminal if needed.